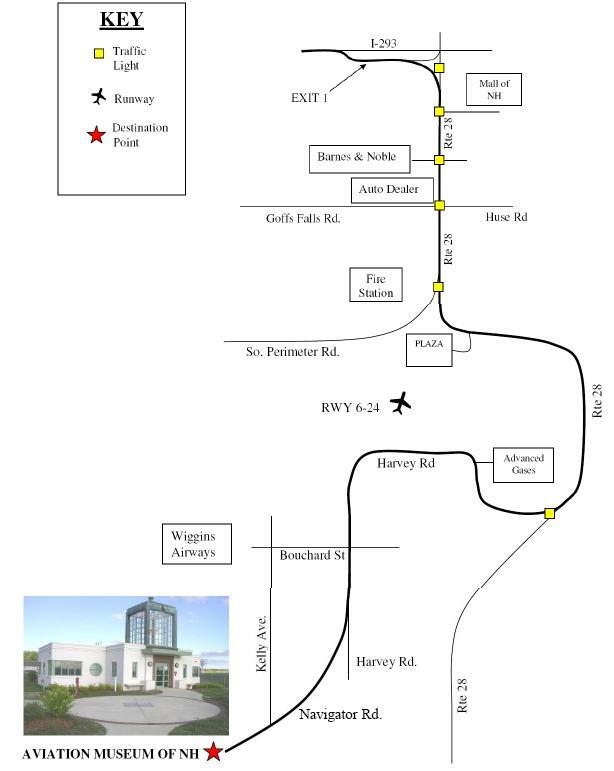 The Museum is located at 27 Navigator Rd (for GPS: renamed from 13 East Perimeter Road) in Londonderry, NH and we are housed in Manchester Airport's historic 1937 terminal building. The New Hampshire Aviation Museum is located on the east side of the Manchester Airport runways. Rt. 93 – Take Exit 5, turn left at end of ramp onto Rt 28 north. Follow for 2.1 mi, turn left onto Page Rd (turns into Grenier Field Rd then Harvey Rd.) Follow for 1.7 mi, turn left onto Navigator Rd (formerly East Perimeter Rd); follow to end, museum on left at observation area. Rt. 293 – Take Exit 1 onto Rt. 28 south, follow for approx. 1.2 mi. Turn right onto Harvey Rd. and follow for 0.8 mi. Turn right onto Navigator Rd (formerly East Perimeter Rd); follow to end, museum on left at observation area. The map below shows you the location of the Museum. Click here to view a detailed driving map in PDF format.